Are you feeding cats in your yard or at a job, restaurants, or empty lot? Or do you know someone who is doing this? Most likely these cats are "Feral" cats. What is a feral cat? A feral cat is just like a house cat except that it is not social to people. It may have been born to a cat who was abandoned or lost and may have had no interaction with people and thus is very wary of them. Feral cats live outside and survive mostly on their own but they do need some help from people in order to live a healthy life. Feral cats are generally not friendly and therefore not adoptable. Feral cats can survive outside with little to no help from people other than to be spayed or neutered, fed and sheltered and medical care when needed. Feral cats are not likely to ever become socialized and are often miserable if brought to live insider. Feral cats should never be brought to an animal shelter since they are not adoptable and usually the only option for them is to be euthanized. "An often misunderstood fact is that the feral cat is not a wild animal able to care for and maintain itself in a healthy state. All cats are domestic animals and dependent entirely on humans to meet their needs. The feral cat has become so because it has been at some stage abandoned and must seek out some sort of food source in order to survive. Quite opposite to general belief, being a domestic animal, they are unable to ‘catch’ enough food in the way of rodents and insects to survive in any healthy state. As a result, the average life-span of a feral cat without assistance is between twelve and eighteen months. 90% of all feral kittens die before reaching maturity." 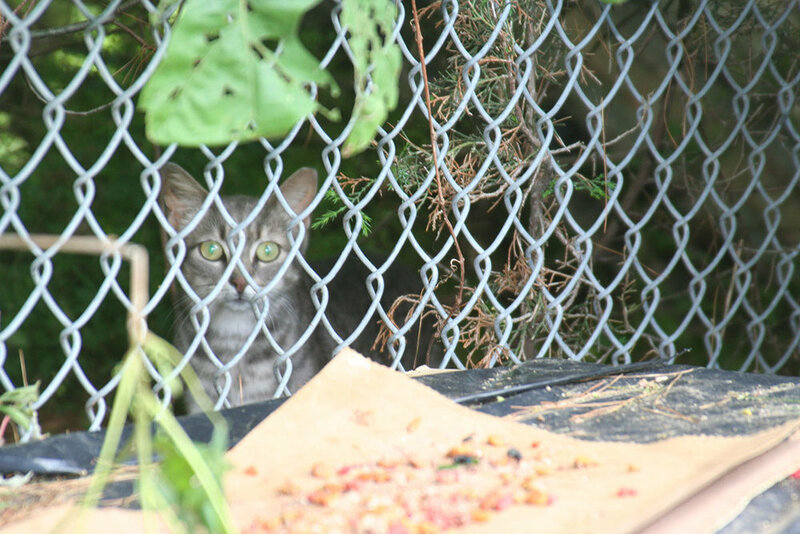 These pictures show feral cats in an extremely well-managed colony. You can see how they hide in the shadows; it is so sad. Even the cats that trust people can sometimes be very scared if anyone new comes to the colony. They run and hide and scatter. Some just watch everything from the shadows and you wouldn't even know they are there, which for them is a lifesaving skill. Unfortunately there are people that have less than humane intentions for some of the cats and running and hiding is a way that they are safe. Shelter Link volunteers help provide care and assistance to feral cats and we have a TNR (Trap-Neuter-Return) Program. The first step is for us to capture the feral cats so we can provide what little human assistance they may need. 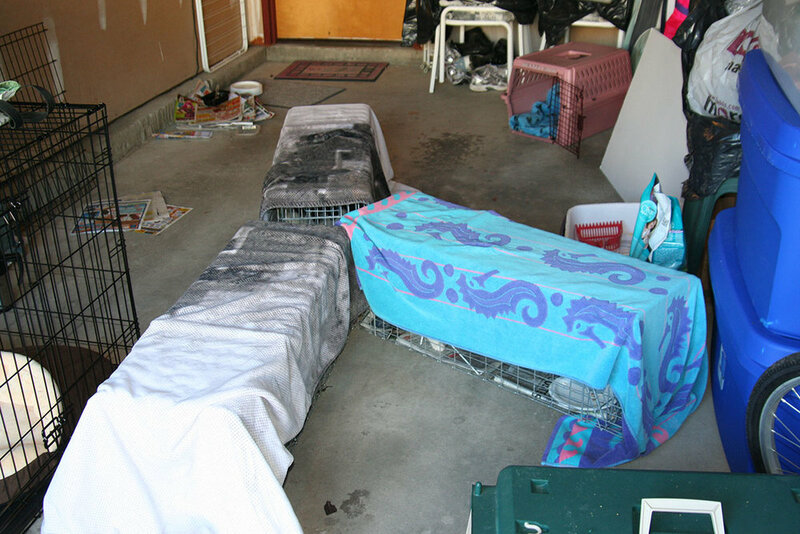 These pictures shows us doing a trapping: setting the traps, waiting for the cats, and the cats caught in traps. To view full-sized on Alley Cat Allies website, click here.